Former Futures for Women Trustee and Chairman, Dr Carolyn Boulter, has made history by becoming the first female Master of the Clothworkers’ Company. Carolyn is the 498th Master of the Clothworkers’ Company and was elected at a ceremony in London on 7 June 2017. She will take the oath and be installed on 19th July and will serve for one year. Founded by Royal Charter in 1528, the original purpose of The Clothworkers’ Company was to protect its members and promote the craft of cloth-finishing within the City of London. The Company’s role today is essentially philanthropic and the Clothworkers’ Foundation makes annual grants of £5 million per year. 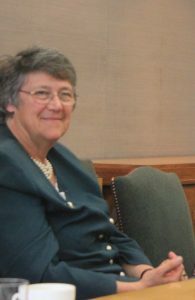 Dr Carolyn Boulter served as a Trustee of Futures for Women for 35 years and held the position of Chairman of the Board for several years during her tenure. She was instrumental in introducing new, more efficient, administrative processes for the charity and also instigated the annual Development Day meeting which gives Trustees an opportunity to discuss a specific issue. Our lunch at Englefield House in March 2015 was masterminded by Carolyn who worked tirelessly to promote the event to her contacts in her local community. Commenting on her appointment as Master of the Clothworkers’ Company Carolyn said: “Clothworker blood flows in my veins and I am honoured and delighted to carry on the family tradition of service to the Company as a scientist, educationalist and especially as a woman”.